If I were an opiliophile in Iceland… I would only encounter four species1. And of these four, only Mitopus morio is widely spread over the island, living at the seashore, in the mountains and on the many islands and islets. The other three species, Nemastoma bimaculatum, Oligolophus tridens and Megabunus diadema, have only been found in the southernmost part of Iceland. This can probably explained by a combination of their introduction (see last paragraph) and the climate. Winters are relatively mild in the southern part, with temperatures of 0°C on average. In the central highlands, the mean winter temperature is around -10°C and in the north even -25°C. Apparently M. morio can handle such low temperatures! Despite the narrow distribution range of N. bimaculatum, O. tridens and M. diadema, they can locally be fairly common. N. bimaculatum seems to select south-facing slopes, an indication that the temperature is a limiting factor for this species. M. diadema is most common near the sea, where it lives on moist cliffs. The North Atlantic Current brings warmth to this part of the world, making the climate of Iceland more temperate than would be expected so close to the Arctic circle. 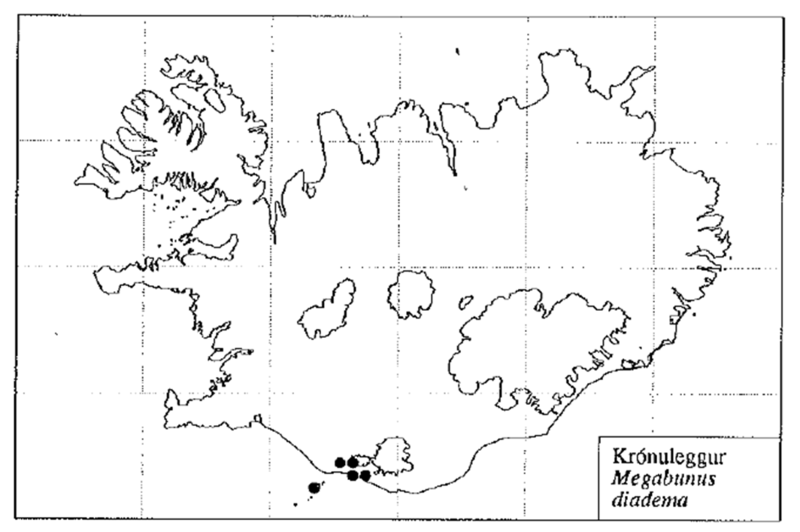 Distribution of Megabunus diadema in Iceland. Figure copied from I. Agnarsson, 1998. Most likely, dispersal is the main reason why so few species of harvestmen occur in Iceland, compared to other areas in Europe with a similar climate. 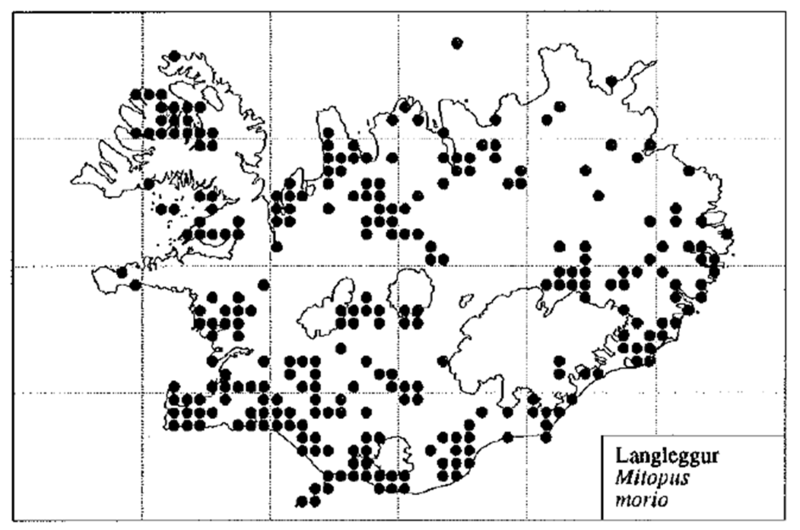 In a recent paper, I. Agnarsson explains that M. morio probably is the only species that has reached Iceland without the help of men. It has been present in Iceland for a long time (a report from 1772 mentions that it already was widespread at that time) and it also occurs on locations north of Iceland, including Greenland, where it is the only species of harvestmen. Nevertheless, I think that the possibility cannot be ruled out that this species was hitchhiking with earlier settlers, for example the Celtic monks that came to Iceland in the seventh or eighth century, or Norse settlers that arrived from the ninth century onwards. The recent discovery (1929) and limited but expanding distribution of the other three species points towards their dispersal by men. 1. This post was entirely based on the publication Íslenskar langfætlur og drekar by Ingi Agnarsson (1998). A complete checklist of all Nordic Opiliones was published by Ingvar Stol in the Norwegian Journal of Entomology (2007). Click the links for PDF’s.